Executive summary: 2nd President of the U.S.
John Adams, second president of the United States of America, was born on the 30th of October 1735 in what is now the town of Quincy, Massachusetts. His father, a farmer, also named John, was of the fourth generation in descent from Henry Adams, who emigrated from Devonshire, England, to Massachusetts about 1636; his mother was Susanna Boylston Adams. Young Adams graduated from Harvard College in 1755, and for a time taught school at Worcester and studied law in the office of Rufus Putnam. In 1758 he was admitted to the bar. From an early age he developed the habit of writing descriptions of events and impressions of men. The earliest of these is his report of the argument of James Otis in the superior court of Massachusetts as to the constitutionality of writs of assistance. This was in 1761, and the argument inspired him with zeal for the cause of the American colonies. Years afterwards, when an old man, Adams undertook to write out at length his recollections of this scene; it is instructive to compare the two accounts. John Adams had none of the qualities of popular leadership which were so marked a characteristic of his second cousin, Samuel Adams; it was rather as a constitutional lawyer that he influenced the course of events. He was impetuous, intense and often vehement, unflinchingly courageous, devoted with his whole soul to the cause he had espoused; but his vanity, his pride of opinion and his inborn contentiousness were serious handicaps to him in his political career. These qualities were particularly manifested at a later period -- as, for example, during his term as president. He first made his influence widely felt and became conspicuous as a leader of the Massachusetts Whigs during the discussions with regard to the Stamp Act of 1765. In that year he drafted the instructions which were sent by the town of Braintree to its representatives in the Massachusetts legislature, and which served as a model for other towns in drawing up instructions to their representatives; in August 1765 he contributed anonymously four notable articles to the Boston Gazette (republished separately in London in 1768 as A Dissertation on the Canon and Feudal Law), in which he argued that the opposition of the colonies to the Stamp Act was a part of the never-ending struggle between individualism and corporate authority; and in December 1765 he delivered a speech before the governor and council in which he pronounced the Stamp Act invalid on the ground that Massachusetts being without representation in parliament, had not assented to it. In 1768 he removed to Boston. Two years later, with that degree of moral courage which was one of his distinguishing characteristics, as it has been of his descendants, he, aided by Josiah Quincy, Jr., defended the British soldiers who were arrested after the "Boston Massacre", charged with causing the death of four persons, inhabitants of the colony. The trial resulted in an acquittal of the officer who commanded the detachment, and most of the soldiers; but two soldiers were found guilty of manslaughter. These claimed benefit of clergy and were branded in the hand and released. Adams's upright and patriotic conduct in taking the unpopular side in this case met with its just reward in the following year, in the shape of his election to the Massachusetts House of Representatives by a vote of 418 to 118. 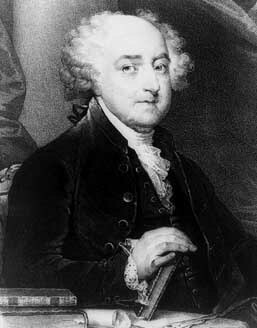 John Adams was a member of the Continental Congress from 1774 to 1778. In June 1775, with a view to promoting the union of the colonies, he seconded the nomination of George Washington as commander-in-chief of the army. His influence in congress was great, and almost from the beginning he was impatient for a separation of the colonies from Great Britain. On the 7th of June 1776 he seconded the famous resolution introduced by Richard Henry Lee that "these colonies are, and of a right ought to be, free and independent states", and no man championed these resolutions (adopted on the 2nd of July) so eloquently and effectively before the congress. On the 8th of June he was appointed on a committee with Thomas Jefferson, Benjamin Franklin, Robert R. Livingston and Roger Sherman to draft a Declaration of Independence; and although that document was by the request of the committee written by Thomas Jefferson, it was John Adams who occupied the foremost place in the debate on its adoption. Before this question had been disposed of, Adams was placed at the head of the Board of War and Ordnance, and he also served on many other important committees. In 1778 John Adams sailed for France to supersede Silas Deane in the American commission there. But just as he embarked that commission concluded the desired treaty of alliance, and soon after his arrival he advised that the number of commissioners be reduced to one. His advice was followed and he returned home in time to be elected a member of the convention which framed the Massachusetts constitution of 1780, still the organic law of that commonwealth. With James Bowdoin and Samuel Adams, he formed a sub-committee which drew up the first draft of that instrument, and most of it probably came from John Adams's pen. Before this work had been completed he was again sent to Europe, having been chosen on the 27th of September 1779 as minister plenipotentiary for negotiating a treaty of peace and a treaty of commerce with Great Britain. Conditions were not then favourable for peace, however; the French government, moreover, did not approve of the choice, inasmuch as Adams was not sufficiently pliant and tractable and was from the first suspicious of Vergennes; and subsequently Benjamin Franklin, Thomas Jefferson, John Jay and Henry Laurens were appointed to co-operate with Adams. Jefferson, however, did not cross the Atlantic, and Laurens took little part in the negotiations. This left the management of the business to the other three. Jay and Adams distrusted the good faith of the French government. Outvoting Franklin, they decided to break their instructions, which required them to "make the most candid confidential communications on all subjects to the ministers of our generous ally, the king of France; to undertake nothing in the negotiations for peace or truce without their knowledge or concurrence; and ultimately to govern yourself by their advice and opinion"; and, instead, they dealt directly with the British commissioners, without consulting the French ministers. Throughout the negotiations Adams was especially determined that the right of the United States to the fisheries along the British-American coast should be recognized. Political conditions in Great Britain, at the moment, made the conclusion of peace almost a necessity with the British ministry, and eventually the American negotiators were able to secure a peculiarly favourable treaty. This preliminary treaty was signed on the 30th of November 1782. Before these negotiations began, Adams had spent some time in the Netherlands. In July 1780 he had been authorized to execute the duties previously assigned to Henry Laurens, and at the Hague was eminently successful, securing there recognition of the United States as an independent government (April 19, 1782), and negotiating both a loan and, in October 1782, a treaty of amity and commerce, the first of such treaties between the United States and foreign powers after that of February 1778 with France. In 1785 John Adams was appointed the first of a long line of able and distinguished American ministers to the court of St. James's. When he was presented to his former sovereign, King George III intimated that he was aware of Mr. Adams's lack of confidence in the French government. Replying, Mr. Adams admitted it, closing with the outspoken sentiment: "I must avow to your Majesty that I have no attachment but to my own country" -- a phrase which must have jarred upon the monarch's sensibilities. While in London Adams published a work entitled A Defence of the Constitution of Government of the United States (1787). In this work he ably combated the views of Turgot and other European writers as to the viciousness of the framework of the state governments. Unfortunately, in so doing, he used phrases savouring of aristocracy which offended many of his countrymen, -- as in the sentence in which he suggested that "the rich, the well-born and the able" should be set apart from other men in a senate. Partly for this reason, while Washington had the vote of every elector in the first presidential election of 1789, Adams received only thirty-four out of sixty-nine. As this was the second largest number he was declared Vice President, but he began his eight years in that office (1789-1797) with a sense of grievance and of suspicion of many of the leading men. Differences of opinion with regard to the policies to be pursued by the new government gradually led to the formation of two well-defined political groups -- the Federalists and the Democratic-Republicans -- and Adams became recognized as one of the leaders, second only to Alexander Hamilton, of the former. In 1796, on the refusal of Washington to accept another election, Adams was chosen president, defeating Thomas Jefferson; though Alexander Hamilton and other Federalists had asked that an equal vote should be cast for Adams and Thomas Pinckney, the other Federalist in the contest, partly in order that Jefferson, who was elected Vice President, might be excluded altogether, and partly, it seems, in the hope that Pinckney should in fact receive more votes than Adams, and thus, in accordance with the system then obtaining, be elected President, though he was intended for the second place on the Federalist ticket. Adams's four years as chief magistrate (1797-1801) were marked by a succession of intrigues which embittered all his later life; they were marked, also, by events, such as the passage of the Alien and Sedition Acts, which brought discredit on the Federalist party. Moreover, factional strife broke out within the party itself; Adams and Hamilton became alienated, and members of Adams's own cabinet virtually looked to Hamilton rather than to the president as their political chief. The United States was, at this time, drawn into the vortex of European complications, and Adams, instead of taking advantage of the militant spirit which was aroused, patriotically devoted himself to securing peace with France, much against the wishes of Hamilton and of Hamilton's adherents in the cabinet. In 1800, Adams was again the Federalist candidate for the presidency, but the distrust of him in his own party, the popular disapproval of the Alien and Sedition Acts and the popularity of his opponent, Thomas Jefferson, combined to cause his defeat. He then retired into private life. On the 4th of July 1826, on the fiftieth anniversary of the adoption of the Declaration of Independence, he died at Quincy. Jefferson died on the same day. In 1764 Adams had married Miss Abigail Smith (1744-1818), the daughter of a Congregational minister at Weymouth, Massachusetts. She was a woman of much ability, and her letters, written in an excellent English style, are of great value to students of the period in which she lived. President John Quincy Adams was their eldest son.